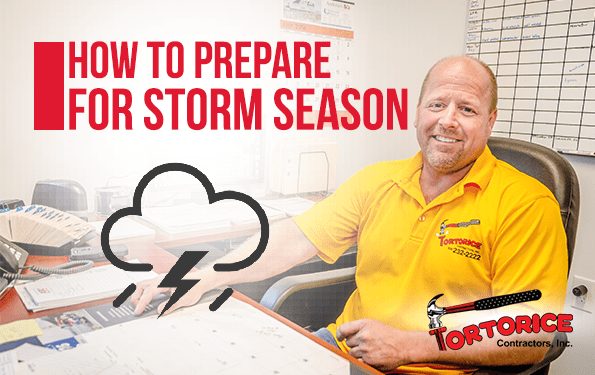 Cherry Hill Township NJ Roofing Contractor: How to Prepare for Storm Season - Tortorice Contractors Inc.
Summer is still in full swing but it’s not going to last forever. As they say, it is better to be prepared than to be sorry in the end. Storms can cause a lot of damage not only to the exterior of your house but also to the interior. This can end up costing thousands of dollars. Checking your roof’s structure regularly and being prepared is especially important. Here are some tips to keep in mind when preparing for the storm season. The first step to roof preparedness is to inspect your roof. This will give you an idea of what to do. For example, you might need to replace rotted shingles or do some maintenance work like cleaning the gutter to make waterways clear. A proper inspection will give you a chance to catch small issues before they become a major headache. If for any reason you cannot access your roof to inspect it, call a licensed Cherry Hill Township NJ roofing company and they can inspect the area for you. Conduct a visual damage search. Look for missing, bent, or curling shingles, as well as dirt and debris, standing water and blocked drains, gutters, and downspouts. Also look for vegetation growth like moss, mold, and mildew and any other damages to your roof. You should also look for cracks, rust, rot, and leaks around your chimney, vents, fascia, decking, and skylights. Remember that not all roofs are constructed the same way so be sure to check nooks and crannies too. Also, check the inside of your house. According to roofers from Cherry Hill Township NJ, water spots are a good indication of water leaks. Remember the location because it could be coming from a hole outside. You can call a reputable roofing company to check your roof. Cherry Hill Township NJ roofers also recommend homeowners clean their gutters before storm season sets in. Clogged gutters can cause water to pool next to your roof and can add weight and moisture damage. Wet leaves and debris can also trap moisture between the shingles and cause rot, mold, and mildew. Gutters are designed to draw water away from your roof and house and it cannot effectively do so if it is full of leaves or clogged. Homes with tall trees are prone to clogged gutters since leaves can easily get inside when it is windy. Check and clean the gutter periodically to prevent leaf build-up. Keep in mind that strong winds can also blow heavily toward the direction of your gutter which can cause additional problems. Trim foliage around your house to prevent clogged gutters. This will not only prevent leaves from blowing into your gutter but also prevent branches from causing damage to your house during a storm. Broken branches can also cause your roof to crack or deteriorate prematurely due to added weight. Cherry Hill Township roofing companies also recommend the removal of piled up leaves and twigs to prevent them from trapping water and moisture. Fix the issues as soon as you know what they are. Cherry Hill Township NJ roofing contractors recommend staying proactive by fixing roofs early to prolong their lifespan. If you have no idea where to start off or have safety concerns regarding repairs and maintenance, consult your local roofer for advice. Before a storm, remember to secure outdoor furnishings like deck chairs, patio furniture, umbrellas, and flower pots. They can get blown away during a strong storm. They can get wet or damaged due to hail and other debris. You can secure the furniture with weights to prevent them from blowing away or you can put them inside the house during a storm. Replacing or repairing a roof can be very expensive. It can also be time-consuming for you. Cherry Hill Township roofing contractors recommend that you follow these steps to preserve your roof before a powerful storm hits your city. Aside from following these steps, regular maintenance and inspections can also prolong the longevity of your roof. Depending on the work needed and the speed of the siding company in Franklin Township NJ you are working with, re-siding a house takes time. During the re-siding period, workers will be around your property and there will be instances when they will need to bring equipment into your home. This could create a lot of inconvenience for you. It can be hard for children to do their homework or for you to run errands or do housework. While re-siding a house is important, scheduling it at a time when it inconveniences fewer people is more appropriate.